So, I've been a little stressed lately. I mean like for the last few months. Getting a few jobs and having a few kids will do that. When I am feeling a bit overwhelmed, like a lot of people I eat a little more and I might drink a little more. It's all about vices and comfort. I've also realized when I'm feeling uncomfortable or uncertain or unsure... like Cher I try to turn back time. When I'm feeling a little stressed or unsure (or when I'm trying to hide my bad roots) my hair gets bigger and my lips get glossier. The 80s--it's my go-to comfort look. That's a very tired me on the left right before work. That's a member of Guns & Roses on the right circa 1980-something. I didn't say it was a good look, I said it is my go-to comfort look. 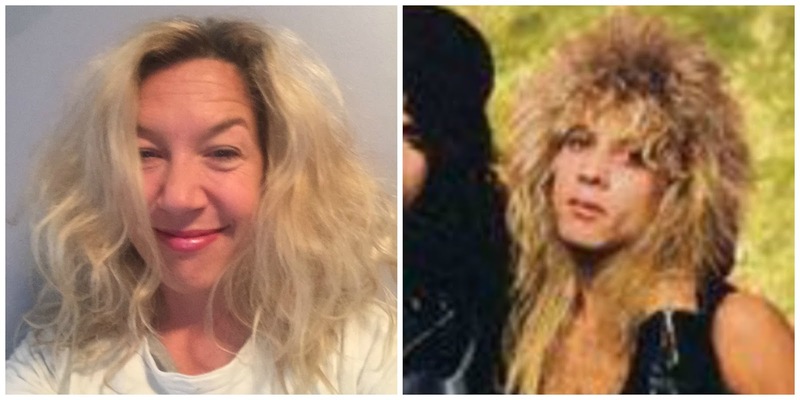 Yeah, looking like a dude that sings in a glam rock/hair band from the 1980s makes me feel better when I'm stressed. It's weird. It makes me a very good candidate for an ambush makeover on TV. It makes no sense, but I know for sure that I feel better when I tease my hair and put lip gloss on like it's 1988. Um, until I see pictures of myself. Waaaaa. I AM IN LOVE WITH MY NEW PANTS!!! Yeah it's all caps because I'm yelling because I'm so excited. Yellow shiny pants with flowers? Um, yes. I got these to wear on stage at Listen To Your Mother in Detroit on Sunday. Come check out the stories and my pants, buy your tickets here. My kid isn't allowed to go to work anymore. Wade went to Take Your Kid to Work Day with Tim at the high school. Tim sent me a picture of Wade with blood all over his shirt and said "he got in a fight." I almost believed him because there were other kids there and Wade is pretty tough. But then I got the real story...some of the high school kids were playing catch in the gym with the little kids and a football hit Wade in the nose and well, blood everywhere. He thought it was a cool story. There's a game to go to almost every night. Woah. Lucy is a gamer. She started playing softball for the first time ever this year and she is doing great and most importantly having so much fun. I'm obsessed with 1980s rock. Lately I've been switching the Pandora channel to 1980s rock. I work out in my basement to Def Leppard, ACDC, Guns & Roses and Scorpions. I feel like I'm in the weight room of my high school and it's 1989 and I love it. Writing thank you letters is a good thing, but being thoughtful is THE thing. I love this video series Gatorade did about Peyton Manning. Here's one from his coaches about how thoughtful he was. What do YOU know for sure? Tell me here or over on Facebook.